Cup on the Bus: A sad end? the morning was crystal, frosty perfect. Which I found, again, on the golf course. by all the fallen bronze leaves. Going to the other end of the pond, a sycamore. Sycamores are bog trees; they live by water. Their root system probably is extensive, but shallow. Like a cottonwood. I didn't look it up. The day was so beautiful I drove down to the heron rookery. I've never been able to do the rookery justice. from taking Hamilton to church. I cannot orient myself, picture to picture, but no matter. Cuyahoga River, along the Bath Road bridge. It's on federal land, and protected. There is an eagle nesting area. This caused me to stop. And there aren't any unpopulated sycamores in the marsh that I can see. I go by every Sunday. I'll keep my eye out and see how the herons take this development. Uh oh...heron condo down. Time to move in with the relatives. It must have been sad to see a Sycamore down. Wish I could help you cheer up. I was very sad when they took down our Willow as it's roots were going in the pipes in the drain. This was over ten years ago. I still miss it. It's a very beautiful area. I love to see all the eagles populating our country after so many died out. It's sad to see a tree go down, but interesting to watch what will take over. There was a rookery at the Bosque del Apache NWR... lots of black-crowned night herons... lots of "croaking" in the late evening. It's gone now... I still miss it when we visit there. I have my eye on a similar development near us - old railway pilings in the harbour where a colony of cormorants lives and nests in the spring/summer/fall. Each year there are fewer pilings. Quite a few more are leaning badly this fall. What will happen to that community of birds when they return next spring? They are already overcrowded. As they are somewhat of a tourist attraction, maybe something will be done. But this is not a wealthy area, and I imagine it would be costly to replace the pilings ... so maybe nature will be left to take its course. That eagle nesting area looks incredible. We recently removed a sycamore. They are the most beautiful trees when fully grown in a group, among the most beautiful I know, in fact. But here in England they seed themselves wild everywhere and grow far too big for many gardens. Fear not,the herons may already have their hearts set on a new pad down the road. The downed sycamore will be new housing for something..if the powers that be don't remove it. You may not remove anything from federal land. That downed sycamore will be left to return to nature. So others will enjoy the pre-fabs for years to come. Aaargh. I hope and trust the herons will find a new home quickly. Oh, nature doing it't thing. It's sad when a tree dies but it's the cycle of life, a new one will grow in it's place. Sometimes nature betrays the camera. Well sycamores are fast growing and maybe there is one close by to take this ones place. Your images are lovely. I could not talk you into putting them int XL size could I? Look at that! Pretty cool! Can you tell me how to move the right margin, or the stuff in the margin. Or, what do I have to do so the picture doesn't bleed over the margin. No matter, how neat to have big pictures! Your photos are lovely, Joanne. I love the reflections! Beautiful photos Joanne. I've never seen so many nests in trees before. At the most I think I've seen three nests in my whole life and those spread out over time and places. You live in such a pretty area. You have a lot of beautiful trees in the area, but it's sad when any of them fall. How fabulous to have a tree full of eagles' nests. Those are beautiful photos, Joanne. So clear and crisp. What lovely pictures. I don't believe sycamores grow in Hawaii. Herons are some of my favorite birds. I love the rookery, that they all want to nest in the same tree/s. I love sycamores too. The ones down here can get leaves as big or bigger than dinner plates. 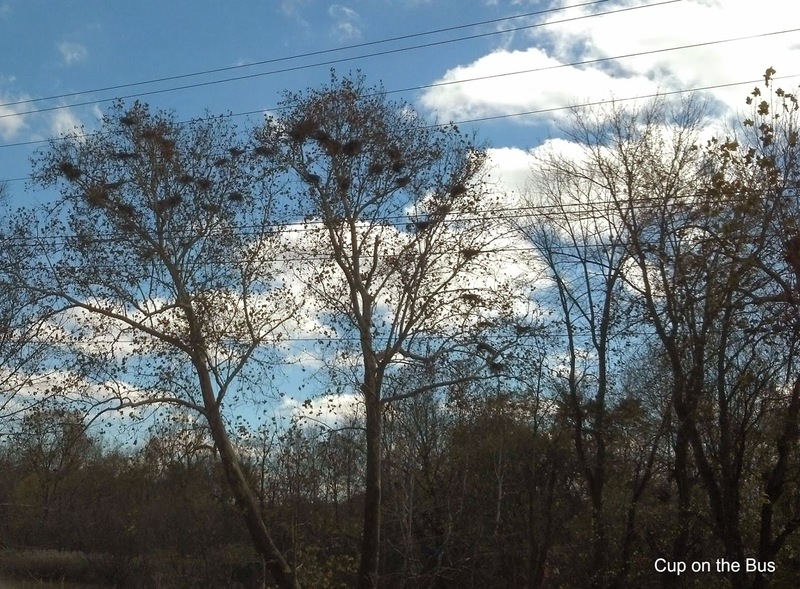 wow, look at all those nests and love the white bark of the sycamores. Some of your photos are just amazing Joanne!